Space scientist Dr Lucie Green has been awarded the prestigious Royal Society Kohn award for her work engaging a diverse audience with science. Dr Green won the award for building up a first-class programme of engagement, communication and outreach projects at UCL's Mullard Space Science Laboratory (MSSL). Her achievements include mentoring scientists within her department and changing its overall culture to encourage public engagement with science. Dr Green's efforts helped UCL be recognised as one of six Beacons For Public Engagement by the UK Funding Councils, Research Councils UK and the Wellcome Trust. The judging panel was particularly impressed by Dr Green's work on the Satellite Stories project, which brought members of communities living around MSSL into the labs for the first time. Local people were given a forum to share their feelings about living near such an active research institution. Staff took time to talk to local people and listen to their views on research and the history and culture of MSSL, which is planning a similar event for next year. Dr Green said: "I'm absolutely delighted to receive this award which reflects the dedication of so many people. Public engagement is such an important part of the role of a university and it is great to see so much taking place across the broad range of research areas at UCL." 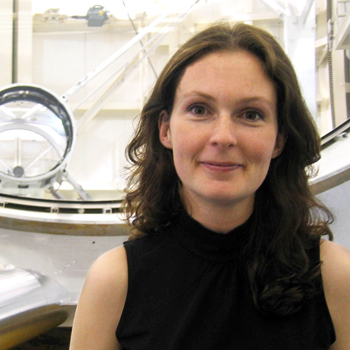 Dr Green is a Royal Society Dorothy Hodgkin Research Fellow working on the study of coronal mass ejections (CMEs). These events are huge expulsions of magnetised plasma from the Sun's atmosphere and are seen as clouds of outward moving material when the Sun is eclipsed. Dr Green studies their magnetic source regions with a view to understanding the changes in the Sun's magnetic field which trigger them. MSSL is throwing open its doors to the public on 5 September as part of the British Science Festival. For more information follow the link above.